I’ve been updating this site because I’m going to make it my main website and blog rolled into one, a bit more user friendly. As such, I’ve been going through a lot of my old art and also my old travel and family photographs. This has reminded me of some very funny, or not so funny at the time, experiences from my childhood. I know I have a brain. I even think it works fairly well. However, sometimes it just disappears for a few minutes. Our favourite camping spot was a place called Bushwackers, about half way between Nairobi and Mombasa in Kenya. 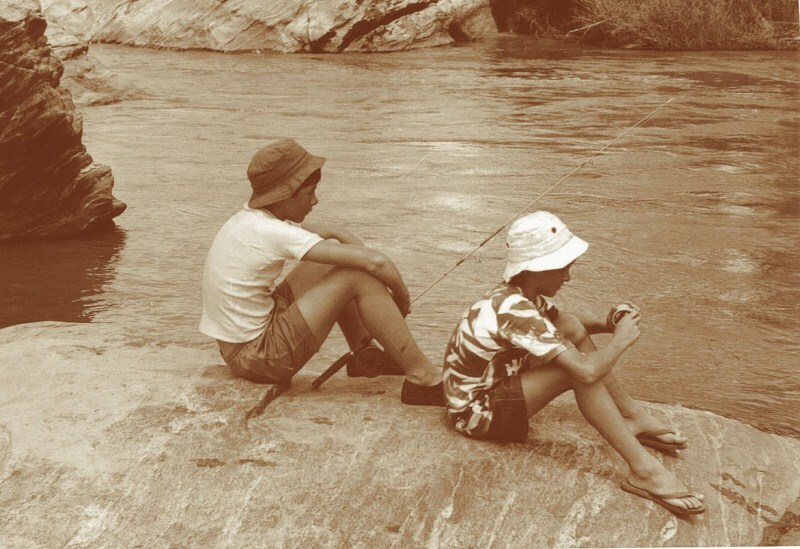 We used to search for animals and we would fish in the Athi river. One day my brother was using the only rod we brought with us so I borrowed a line on a spool from the campsite owners. This photo was taken just before the incident. You can see the spool I was using. After we’d been fishing for a while, my brother cast in again and I tried to cast further than him. Unfortunately I let go of the spool so the hook, line and spool all went into the river. This would have been worth less than a few cents but I didn’t want to lose it because it was the camp owner’s not mine (I tried to take my responibilities very seriously). I jumped off this rock, ran downstream about 50 metres and ran chest deep into the river hoping the line would wrap itself around me and all would be well. The next thing I knew was my dad running towards the river at 100 miles an hour, shouting at me to get out, and when I did get out I received the biggest smack on the head I ever have had accompanied by some language that I didn’t understand at the time. Dad was terrified!! The Athi river is home to hundreds of crocodiles. We’ve seen many of them at this very point. I’ve seen many of them at this very point. Like I said, the brain went missing for a few minutes. This photograph is of me and my dad. He was an engineer on the East African railways, building bridges. 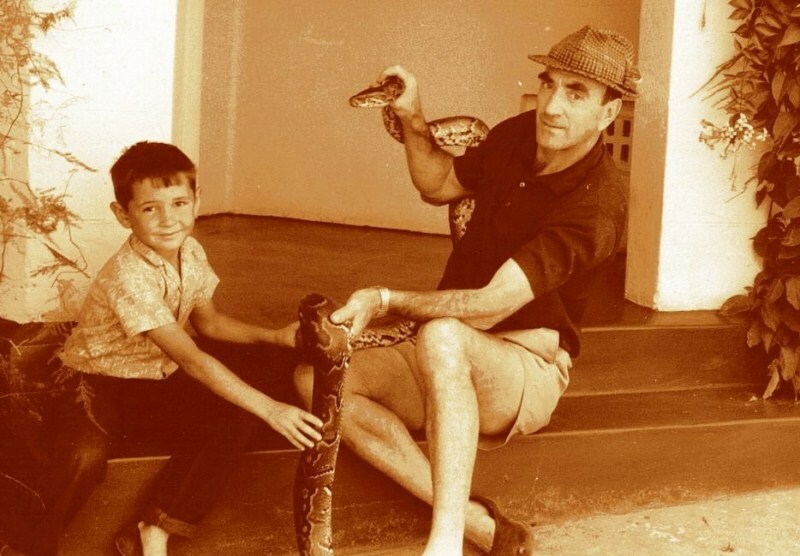 However, he was also fascinated with animals and especially snakes. He even wrote a book called Reptiles and Amphibians of East Africa. We had this snake for most of the six months we lived there and in that time it ate one frog. Pythons can go long periods of time without food – it simply means they’ve fed well at some point in time recently. Maybe it had eaten a small antelope before we ended up with it. Anyhow, we also had a chicken. Chickens are fine food for a python and you’d think it would keep its distance for fear of becoming ‘chakula’ (food in swahili), but no, not this chicken. It used to wait til the python coiled up for a sleep and it would clamber into the middle of those coils and go to sleep itself. It never did get eaten – not by a reptile anyway. One of our many pets was a zorilla. This is a polecat and the best way to describe it is Africa’s equivalent of the American skunk. We called it ‘Yardley’ after the perfume of that name. It once went missing for two weeks almost in the middle of Nairobi, and turned up on our doorstep once we thought it was either gone for good or dead. It looked very much worse for wear but it recovered just fine. My dad loved his photography and this is a shot he took of the zorilla. This was in the days before digital cameras and clever things like Photoshop. If you wanted a picture like this, you either had to wait for days or weeks out in the wild or you had to be clever yourself. This was set up in our spare bedroom in Nairobi, green plants up against the wall, stones on the floorboards. 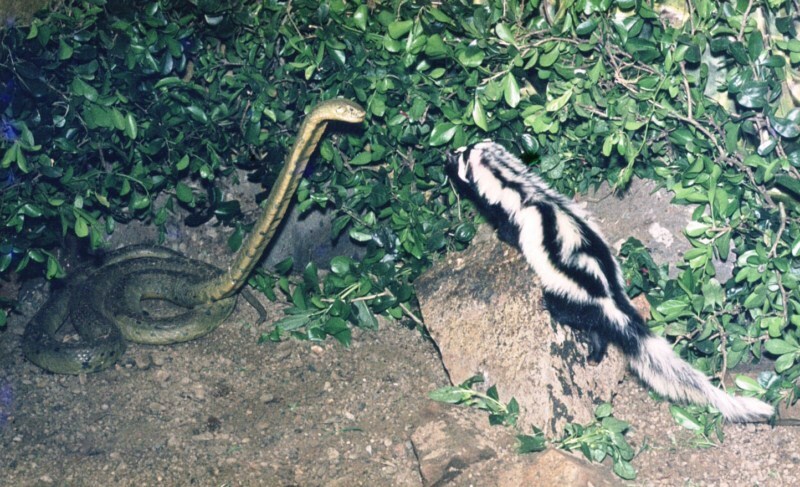 The snake is a pretty realistic looking plastic cobra (much better than the ones they give you at fairgrounds nowadays) and the zorilla isn’t looking at the snake’s head, it’s actually looking at me, standing out of the picture, holding a juicy lump of raw meat. I mentioned before that we loved fishng at Bushwackers campground. One time we’d done particularly poorly, not even getting a single bite. On our way back to camp, dad encountered a poacher, not a rhino horn poacher but just a local bloke tryng to feed his family with some fish. He could catch fish but not where he was, on the camp’s private property. Dad threatened to report him but the guy made a deal, promising not to do it again if he revealed a great fishing spot to us. Dad let him go and we went in search of this spot. After three hours of trying, we thought we’d been done and went back to camp empty handed and annoyed at the poacher. In the morning, before breakfast, we decided to have one last go. We had half an hour to spare before we needed to pack up and go back home to Nairobi. In that half an hour, we caught 72 tilapia. Fed us for weeks!! 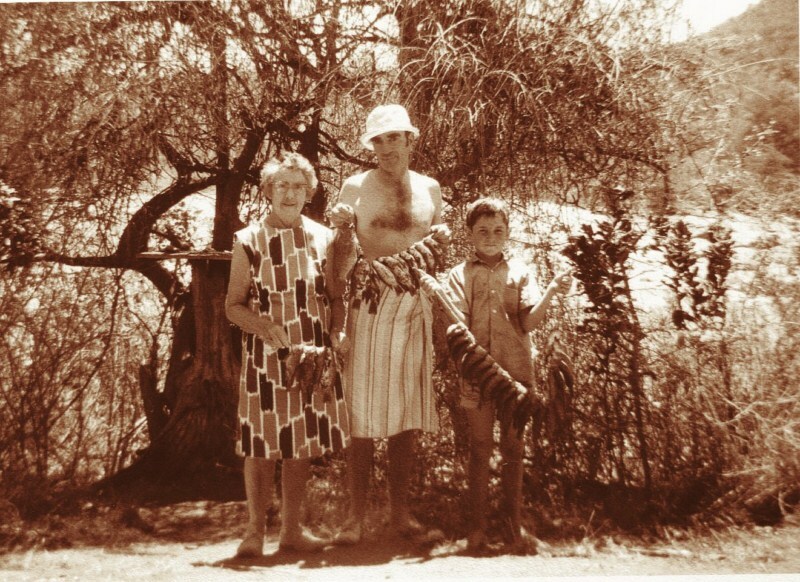 Here I am with Dad and my Grand Mother holding some of those fish. I’m sure I’ll be back with more stories one day. Wonderful stories Patrick. Just wonderful. What a great childhood! Thanks for sharing.